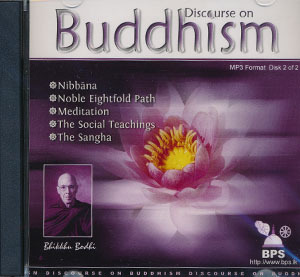 This 2 CD set contains discourses by Bhikkhu Bodhi on various topics including: Nibbana, the Noble Eightfold Path, Meditation, Social Teachings, and the Sangha. The files are in MP3 format (they won't play in a normal CD player that doesn't play MP3 files, but they will play on a computer or digital music player). I don't have much idea about this site. I'm a learner of Buddhism.